Round one of the Rally America National Championship kicked off this last weekend with the iconic Sno*Drift Rally in Atlanta, Michigan. The snow covered and icy roads of Montmorency County played host to both national and regional competitors with just 36 entries this year. Although a little light in car count vs. some of the past seasons, this is an event that seems to have an ebb and flow of entrants from year to year. What makes Sno*Drift so unique isn’t just that it is a winter rally, but that it is a winter rally where the competitors can’t use studded tires. This year’s event stages were similar to last year encompassing 57.71 competitive stage miles on Day 1 which ran into the night, and a whopping 71.75 competitive miles on Day 2 that includes the 23 mile That Old Black River stage which is one of the longest on the entire Rally America calendar. Massive time can be made up or lost in that stage alone. That’s a total of 130 stage miles of snow and ice racing. Conditions wise, the weekend weather brought a traditional Sno*Drift like we have seen many times before. A fresh 6 inches of snow fell on Thursday during recce, but the rest of the event was cold and dry with some biting wind to throw in for good measure. The main story for Day 1 was tires. Not so much about tire choice, which is still always a challenge at Sno*Drift, but more about punctures. The softer rubber in snow and ice tires make them more vulnerable to punctures as it is, and on top of that it didn’t take long for front couple of cars to dig out rocks that wrecked havoc on the field behind. It’s one thing to have a single puncture, but multiple punctures are not something that most teams are used to having to deal with. Many tire issues happened on stages 1 or 2 which meant that if you didn’t have enough spares you would have to drive many more miles on the shredded remains losing time until service. The second pass on Day 1 were the night stages, and to make things more challenging the hot cars had melted the softer snow leaving slippery glare ice below. This is where Super Production driver Lauchlin O’Sullivan tried a unique tire setup that was first used by Citroen’s Sebastien Loeb and then Ford’s Jari-Mati Latvala at Rally Monte-Carlo in 2012. O’Sullivan used both tire compounds (ice tire and snow tire) but put them on the car in a diagonal cross-pattern. 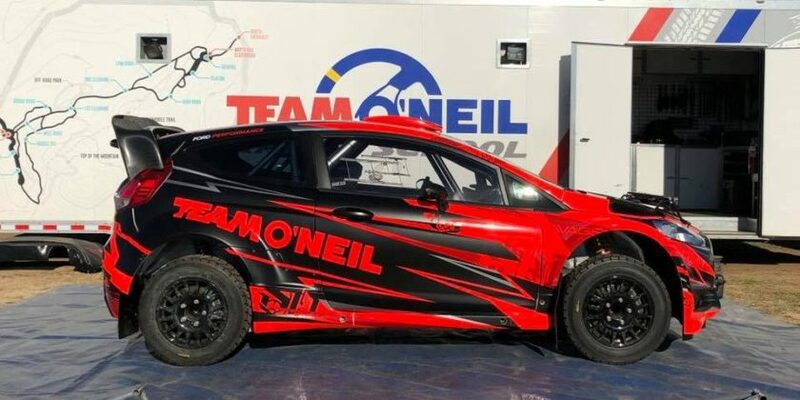 The concept worked, but unfortunately O’Sullivan’s overheating issues are what kept him from capitalizing on Super Production leader Nick Roberts and co-driver Rhianon Gelsomino. O’Sullivan wasn’t the only one having to deal with the irony of overheating issues in the freezing temperatures of Sno*Drift Rally. 2nd place overall was Open Class driver Adam Yeoman and co-driver Jordan Schultz of FY Racing who had similar issues. At the end of the day were thinking the crew might have to spend an all-nighter replacing the engine if they couldn’t figure out the cause of the overheating engine. Meanwhile well out front were the factory Subaru team of David Higgins and Craig Drew. The new 2015 Subaru WRX STi was performing as well, if not better than the previous car. Day 2 was a long one with two service park breaks, two runs through a short super special stage, the monster That Old Black River stage, and a finish through Bonfire Alley. Higgins led the field onto the stages once again followed by FY Racing’s Adam Yeoman. Unfortunately Yeoman’s overheating issues that they thought were resolved had returned and eventually become catastrophic and he pulled out and was unable to make it to service. 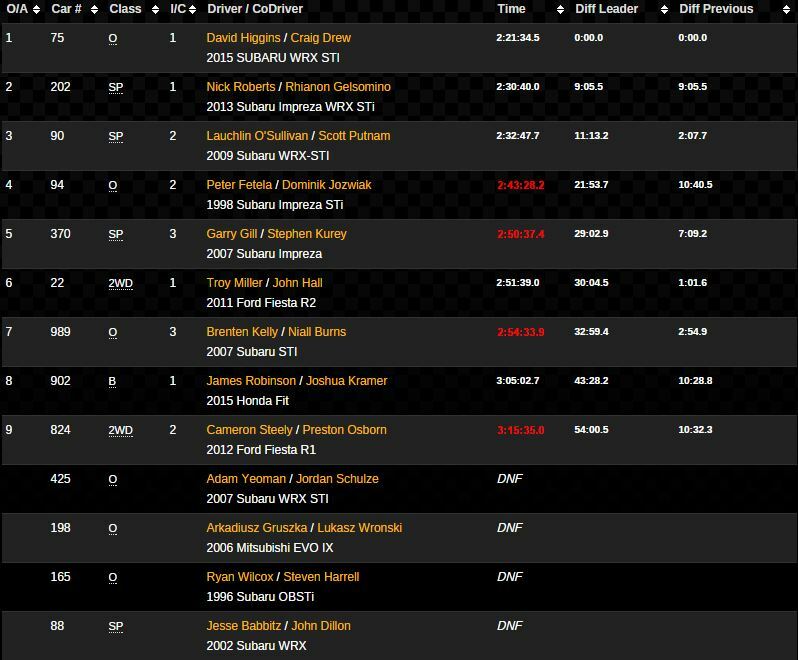 Meanwhile Lauchlin O’Sullivan’s Lucas Oil Subaru was back on song and was trading stages all day with Nick Roberts, but Roberts already had a comfortable 1 minute lead from the previous day and played it steady to the finish. Makes you wonder how the Super Production class battle might have been if O’Sullivan didn’t have mechanical issues on Day 1. With Gary Gill coming in 3rd. In 2wd Troy Miller drove his Ford Fiesta R2 to a fairly dominant win ahead of regional drivers Ian Topping in a classic Volvo 242 and Reid Andress in a Mitsubishi Lancer coming in 3rd. In B-Spec, James Robinson of Honda Performance Development was driving a brand new 2015 Honda Fit for this season, and he was the most comfortable driver in the entire rally with his fully functional heater in the car. Not only did Robinson win B-Spec, he also finished 8th overall in the national standings. Also of note, Michigan native Brenten Kelly in the 2nd FY Racing team car was quite happy to just finish the rally after last year getting stuck in a snow bank. 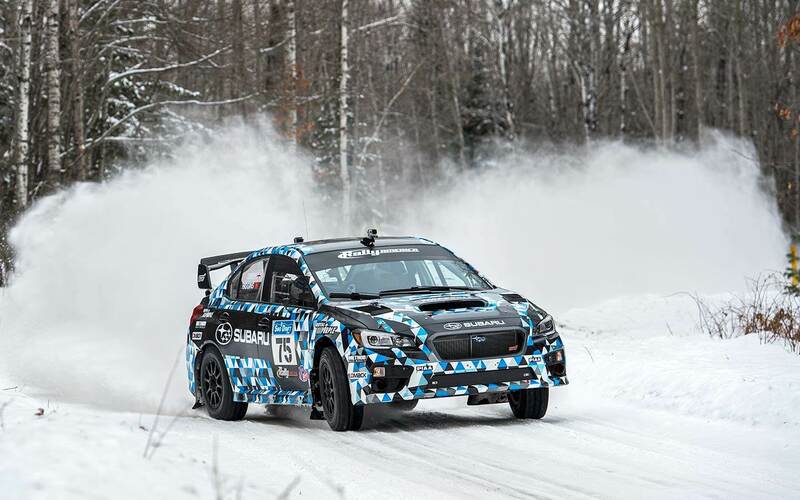 The headline was David Higgins and Craig Drew taking the first win ever of a 2015 WRX STi rally car. The new platform is not only a different look being a sedan vs. the hatchback, but it also has a number of design differences that make it a more rigid chassis. Subaru Rally Team USA did a brilliant job preparing the car as it had zero issues all weekend. I was curios whether the new car was really as fast as the previous car, and unfortunately I only found 1 stage that was a repeat from last year’s Sno*Drift rally, the 3.23 mile Hungry 5 stage. Last year in a battle with Antoine L’Estage, Higgins finished Hungry 5 in 3:24. This year in the new 2015 car he finished it in 3:09 even though he didn’t have to push. Okay, a single short stage isn’t enough to truly compare the performance of the two cars but one thing is for certain, the new car is no slouch and will be chewing up the stages all season. So…. 13 National competitors, and only six in the open class, and exactly one team funded at a properly professional level. I know that the regional participation in Rally America events remains strong, but are we seeing the series returning to a regional club racing affair? 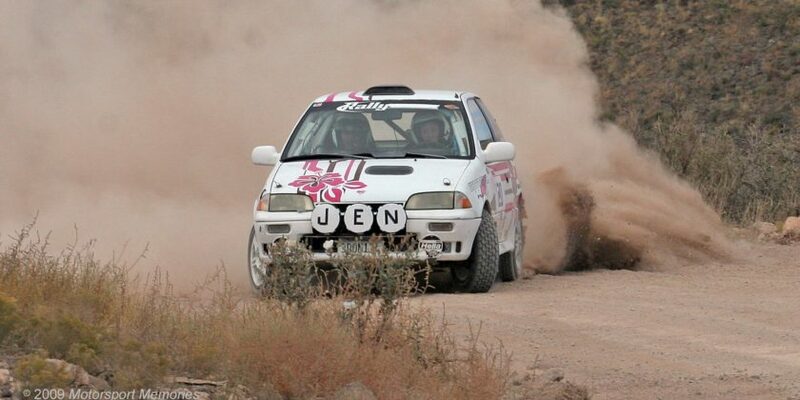 If stage rally is to grow in the US, there needs to be proper professional-level, factory-supported competitors. Without that, the sport will never grow beyond the regional level. I don’t doubt the passion of people like Yeoman and Roberts, but they simply do not have the resources to compete at that top level. Look at the teams and talent involved in the GRC and then look at RA, and you’ll see why the former has a TV contract and the latter does not. Doug – Interestingly GRC began with few manufacturers and only a couple of professional drivers. They went the direction of getting the TV product first with a lot of promises (which honestly wasn’t very good in the early days), and the TV is what then drew in the other manufacturers and drivers. Not that it helped Rhys Millen much as Hyundai has now pulled out of the Red Bull GRC. That said, I do agree that RA needs some sort of TV product, even if it is just a story telling post event product like Subaru’s Launch Control. Something is better than nothing to draw in those sponsors. Another thing that would help RA is if drivers from GRC would do double duty and compete in RA as well. I think it would be good for both sports personally. There is also the hope that Ford might return to american rallying in the open class with the release of the new Focus RS this morning.